Effective money management is important for several reasons. Managing money wisely makes it possible to save money for emergencies and save up to reach financial goals. Effective money management also makes it possible to plan for the unexpected. Someone who saves will have less financial difficulty following a job loss or medical emergency than someone who spends his or her entire paycheck without thinking about the future. Managing money effectively also makes it possible to get out of debt and reduce the amount of interest paid on credit cards and loans. Some of the best ways to manage money effectively include saying no to investments that are not financially sound, saving a certain percentage of every paycheck, creating a monthly budget to track income and expenses, and limiting the purchase of items that are not necessary expenses. In simple terms, a budget is a document that helps track how much money is coming in and how much money is going out. Some people use a computer to create a budget, but it is possible to make an effective budget with a pen and paper. The budget should contain columns for income and expenses. Record all expected monthly expenses at the beginning of each month. These expenses include car payments, rent or mortgage payments, and utility payments. Unexpected expenses might include car repairs or the bill for a plumbing repair. Record these expenses as they are incurred. In the income column, write down any income earned for the month. Income might come from a full-time job, home business, or pension. Monitor all recorded income and expenses each month to help determine when to cut back on spending. What is a Budget? : This resource explains what a budget is and lists some of the factors to consider when creating a budget. Develop and Implement a Budget: This resource from Brigham Young University includes a sample budget template and information on implementing a budget. Budget 101 (PDF): This page explains why a budget is so important and offers information about creating a personal budget. Goal-Driven Budgeting (PDF): This resource discusses the importance of developing budgeting goals. Anyone with a monthly credit card or mortgage payment knows how expensive it is to keep paying interest on a high balance. Paying down debt is one of the best ways to manage money effectively, as reducing the amount of principal owed also reduces the amount of interest a person will pay. Figure debt payments into a monthly budget plan to ensure there is enough money available for paying these debts. Paying down debt does not necessarily mean scraping together enough money to pay off every credit balance. It simply means paying extra on credit card or loan payments. If the minimum payment due is $20, a payment of $40 will shave a little off the total amount owed. Making bi-weekly mortgage payments instead of monthly payments can cut thousands of dollars of interest off a home loan. Once credit card balances are paid down, use the cards only when necessary and try to pay them off in full each month. Start Down the Road to Reducing Debt: This page contains several tips for those who want to start paying down their debt. Credit and Debt Management: This page shows how interest increases the cost of a loan or credit card. Getting Out of Debt: This article offers tips and advice for students who need to get out of debt. Self-Help Guide for Getting Out of Debt (PDF): This guide from Clemson University is for people who need help getting out of debt. Learning how to distinguish between wants and needs is an important part of managing money effectively. Food, water, shelter, personal hygiene products, and clothing are just some of the items that everyone must buy. While cable television, video game consoles, and high-tech computers are nice to have, they are not necessary for survival. Taking the time to consider planned purchases is a good way to save money. Everyone should take the time to review their personal budgets and reflect on whether an item is needed, especially before buying an expensive item like a computer or a large television. Curbing impulse purchases can reduce expenses and make it possible to put more money away for the future. Budgeting Steps: This resource explains the importance of considering needs versus wants when creating a budget. Save for the Future: This article explains the importance of saving for the future. Needs vs. Wants: This activity can help kids understand what they really need and what they want. Needs vs. Wants Worksheet: This worksheet will guide users in distinguishing their needs from their wants. Popular financial advisors and financial self-help books advise people to “pay yourself first.” This is a fancy way of saying that everyone should take a certain amount of money out of their paychecks and set it aside in a savings account or growth account. Many people have good intentions when it comes to saving, but before they know it, they have spent their entire paychecks without a cent left for savings. Taking money for savings before paying any other expenses helps people develop good savings habits. Once this becomes an automatic behavior, it will be much easier to save for large purchases or plan for retirement. Saving just 10 percent of a paycheck can help immensely during a financial emergency. Money-Saving Tips (PDF): This article contains more than 20 tips for saving money. Pay Yourself First (PDF): This resource offers tips for making it easier to pay yourself first. Financial Literacy Tips: This resource offers tips for students who want to save money. Saving and Investing (PDF): This article discusses the importance of saving and investing money. Spending less money makes it a lot easier to set funds aside for savings or investments. While some people may not be able to trim any more expenses from their budgets, others should look at ways to cut spending and save more money. Someone with cable television might consider downgrading from the deluxe package to the basic plan. High-speed Internet users may be able to request a less expensive plan from their Internet service providers. Eating at restaurants every week costs a lot more than preparing nutritious meals at home. Spending less does not mean giving up enjoyable things. Using coupons or waiting for a favorite product to go on sale can also help save money and make it easier to manage money effectively. Family Finance: This page offers tips for cutting spending and finding help in tough economic times. 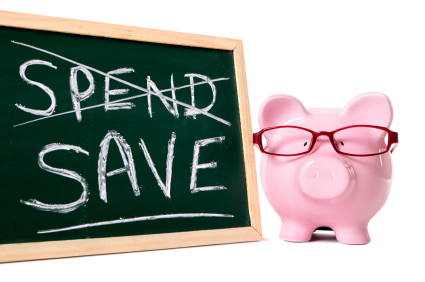 Save Money, Spend Less: This article explains several ways to cut spending and save more money. Tips for Saving Money (PDF): This resource offers tips for saving money on purchases. How to Avoid Spending Too Much Money (PDF): This resource offers several tips to help people avoid spending too much.